Queens of the Stone Age will release a new album this June, and they have the name set, too: ...Like Clockwork. Over at the band's website, fans can hear what appear to be brief snippets of new tracks, as Antiquiet notes. With each refresh of the page, a range of sounds kick in, from a swirling guitar with thumping drums to driving power chords and unearthly, choral sighs. Over the past few months, the album's wide array of guests has been unveiled. Dave Grohl, Trent Reznor, Elton John, Scissor Sisters frontman Jake Shears and the band's original bassist, Nick Oliveri, are all set to appear. It is the band's first LP since 2007's Era Vulgaris. 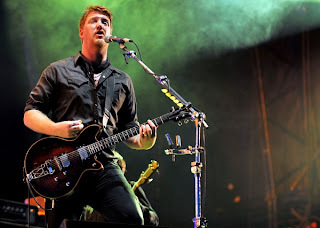 You can also check out this clever mockumentary about the making of the record starring frontman Josh Homme and British comedian Matt Barry, who mixes up the band's history, tries and fails to talk shop about recording gear and marvels at the "guitarded" amount of guitars in the band's studio.